Mophead Features The Unique Maximizer Blend That Delivers A High Absorbency Ratio And Improved Productivity. Made Of Yarn Fibers Of The Highest Quality And Durability, This Medium-Size Mop Absorbs Up To Three Times As Much As Cotton And Offers 30 Percent More Floor Coverage And 25 Percent Less Weight Than Traditional Mops. With Industry-Leading Durability, This Mophead Is Developed To Withstand Up To 50 Commercial Laundering Cycles. Distinct Color Allows Color-Coding To Easily Distinguish And Identify Which Products Should Be Used In Which Areas Of A Facility, Reducing Cross-Contamination. Use The Blue Mop For General-Purpose Cleaning In Low-Risk Areas. Handle/Mop Is Sold Separately. Universal Headband Works With Industry-Standard Mop Handles Including Rubbermaid Commercial Invader And Gripper Clamp-Style Mop Frames..
Mophead Features The Unique Maximizer Blend That Delivers A High Absorbency Ratio And Improved Productivity. 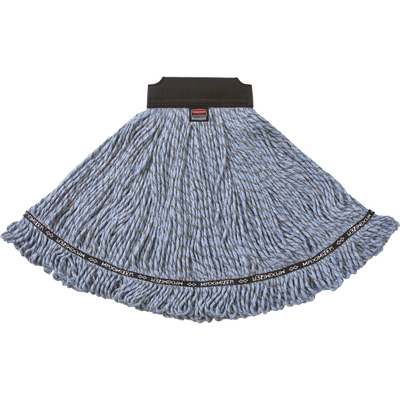 Made Of Yarn Fibers Of The Highest Quality And Durability, This Medium-Size Mop Absorbs Up To Three Times As Much As Cotton And Offers 30 Percent More Floor Coverage And 25 Percent Less Weight Than Traditional Mops. With Industry-Leading Durability, This Mophead Is Developed To Withstand Up To 50 Commercial Laundering Cycles. Distinct Color Allows Color-Coding To Easily Distinguish And Identify Which Products Should Be Used In Which Areas Of A Facility, Reducing Cross-Contamination. Use The Blue Mop For General-Purpose Cleaning In Low-Risk Areas. Handle/Mop Is Sold Separately. Universal Headband Works With Industry-Standard Mop Handles Including Rubbermaid Commercial Invader And Gripper Clamp-Style Mop Frames.